Slow Cooker Tomato Tortellini Soup - seriously delicious! Everyone LOVED this no-fuss soup recipe. Just dump everything in the slow cooker and let it work its magic. Serve soup with some crusty bread for an easy weeknight meal the whole family will enjoy! 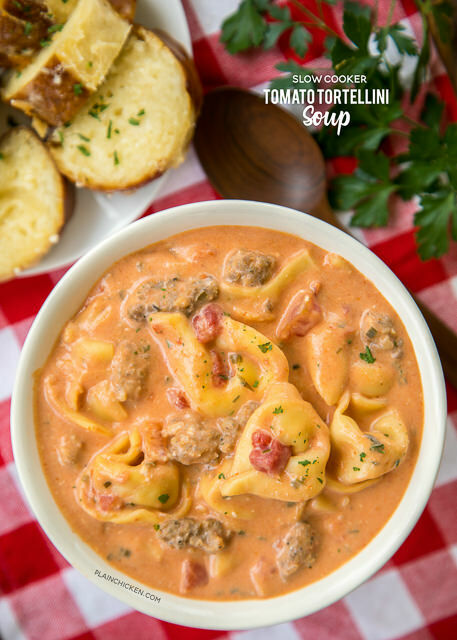 Chicken broth, tomato soup, diced tomatoes, Italian sausage, chive and onion cream cheese and cheese tortellini combine to make THE BEST tomato soup EVER! 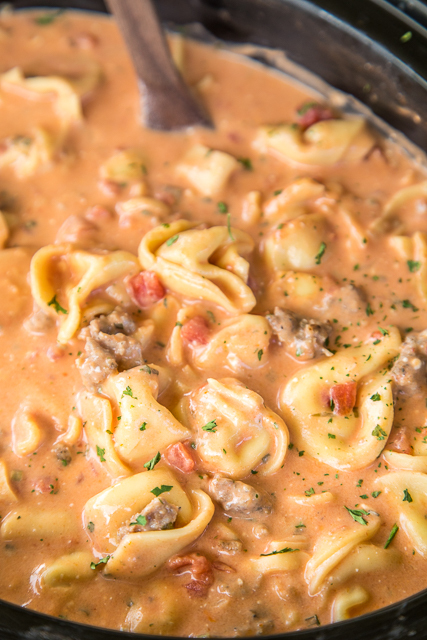 This Slow Cooker Tomato Tortellini Soup is a new favorite. I love creamy tomato soup. I order it anytime it is on the menu! 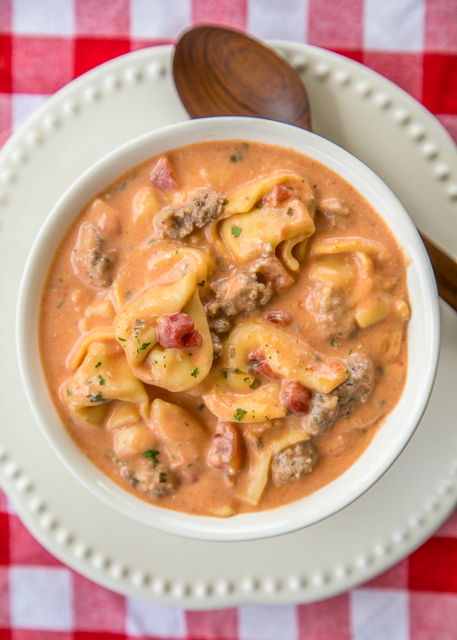 Take a yummy creamy tomato soup and add Italian Sausage and cheese tortellini and I am in foodie heaven! All of my favorites rolled into one delicious dish. The best part about this recipe is that it is made in the slow cooker. Just dump everything in the slow cooker and let it work its magic! This Slow Cooker Tomato Tortellini Soup was a huge hit in our house. We ate this for dinner and leftover for lunch the next day. I am already planning on making this again very soon. I just can't get enough of this soup!!! The creaminess comes from onion and chive cream cheese. It adds SO much flavor to the soup! I could eat this every week this fall and winter and never tire of it!! All you need is some crusty bread and you have a amazing no-fuss weeknight meal! In a skillet, cook Italian sausage until browned and no longer pink. Transfer cooked sausage to slow cooker. Add chicken broth, tomatoes and tomato soup to slow cooker. Cover and cook on LOW 6 to 8 hours. Stir in cream cheese and cheese tortellini. Cover and cook on HIGH for 15 to 30 minutes, until tortellini is cooked. could you do this on the stove and not use a slow cooker? if so, how long would you cook the sausage and soups before adding the cheese and tortellini? I was wondering the same thing. Trying it tonight on the stove. Made this for dinner tonight -- I was very curious about the ingredients. DELICIOUS!! Whole family liked it. Will now to into our soup rotation. Makes alot. Can I thaw my frozen tortellini out before putting in crock pot or should I go buy refrigerated? I think thawing frozen tortellini should work just fine. Is the tomato soup condensed or the ready to eat kind? I used Campbells condensed tomato soup - it is SO good!! Enjoy! Thanks, Stephanie! Can't wait to ate this. Anyone have a better idea instead of a can of tomato soup? Tomato juice along with can of tomato sauce? Any ideas I would love to hear. Thanks! I obviously don't have a "better idea" since I made it this way and LOVED it. You are more than welcome to experiment with the recipe and make it to your liking. Might be a silly question.. but did you drain the diced tomatoes? No - just dump the whole can in the slow cooker. I just made it on the stove top and it worked just fine. I had to let it simmer for about 30 or 40 min to cook some of the liquid down before adding the cream cheese. I ended up adding fresh spinach at the very end and it was FANTASTIC. This soup hit the spot! I'll definitely be making it again. What would be a good replacement for sausage - - chicken maybe? Thank you! Made this last night for a warm dinner after a very cold day. It was very good!! This sounds sooo good! My husband won’t eat onion or chives though. Is there another type of cream cheese you recommend? What size slow cooker are you using? Mine is only 4 quart. I dont want to run out of room for all of the goodness!!! Great recipe. I used half hot Italian sausage and half chicken. I also added crushed red pepper, minced garlic and fresh baby spinach chopped along with the cream cheese. I made this last night and it was so very good! I’ll add it to my favorite meals board on Pinterest. Hubby and I are empty nesters, so we have a lot left over, but our kids live nearby and I’m sure we will share some with them. Thanks for making such a good recipe! Do you have instructions for this recipe in an instant pot? I haven't made this in the Instant Pot, so I don't know how long it would take. Even hubby liked. Used Rotel tomatoes as we like things spicy. Threw in tortellini frozen but probably need to let cook maybe 5 minutes longer if frozen. Leftovers freeze well. Also used organic boxed tomato soup instead of canned. Don't care for the metal taste in canned. Yummy! I accidentally used diced tomatoes not petite. Would that be ok? I just made it on the stove top because I have no concept of time even as I approach 30 years old lol - made it for my husband's valentine day gift! It turned out amazing. He was very happy - and we have so many leftovers. I think it tastes even better heated back up!! I followed the recipe but just added some chopped garlic, onion, and some italian seasoning. And of course my secret ingredient - a certain hot sauce. But even without the extras it would have been fab. Just some salt and pepper. Thank you so much! How long would you cook it on high? Three hours? I’m guessing it’s better on low, but just wondering. I haven’t tried this on HIGH. I assume it would be 3 to 4 hours. I just made this the other day on HIGH for aboit 3.5 hours. It came out wonderfully delicious!